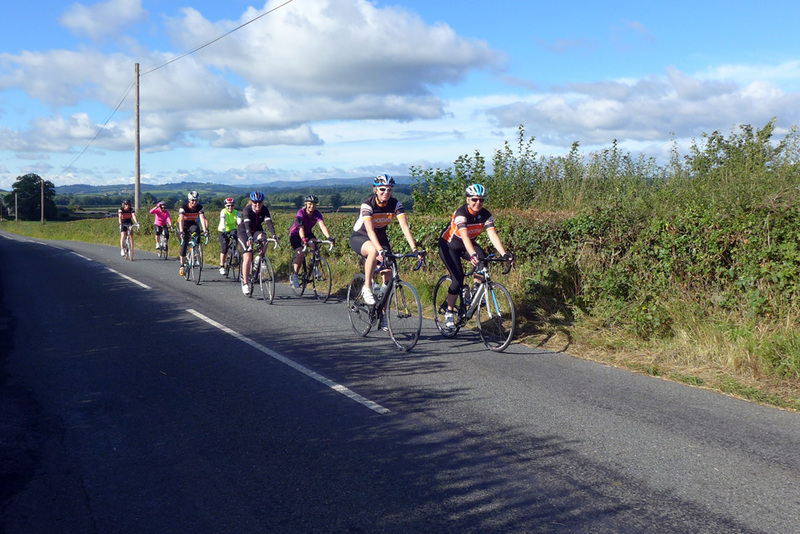 On Saturday, 7th September our Club saw the very first Mon Wheelers ladies only ride starting and finishing in the picturesque village of Usk. 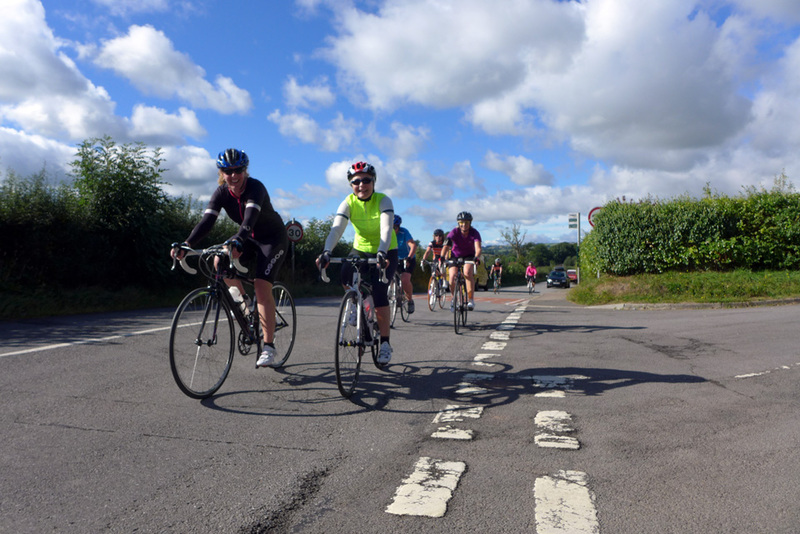 Sue Hollin, our Membership Secretary organised the ride and route – The route itself was carefully chosen to enable riders of all abilities to participate whilst still providing enough of a challenge. The route comprised 27 miles around the Vale of Usk, taking in Raglan and with a planned stop at The Red Door Deli, Mitchel Troy, before retracing the same route back to Usk. 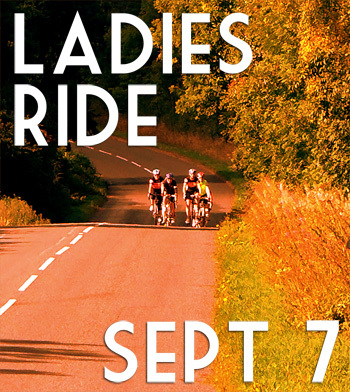 The ride was to be a chance to meet up and ride in a relaxed environment, promote women’s cycling and have fun. The morning of the ride revealed dark clouds and the remnants of an overnight downpour which briefly looked ominous. However, as the riders began to congregate in the main car park in Usk, the clouds began to disappear and the sun started to peep out. 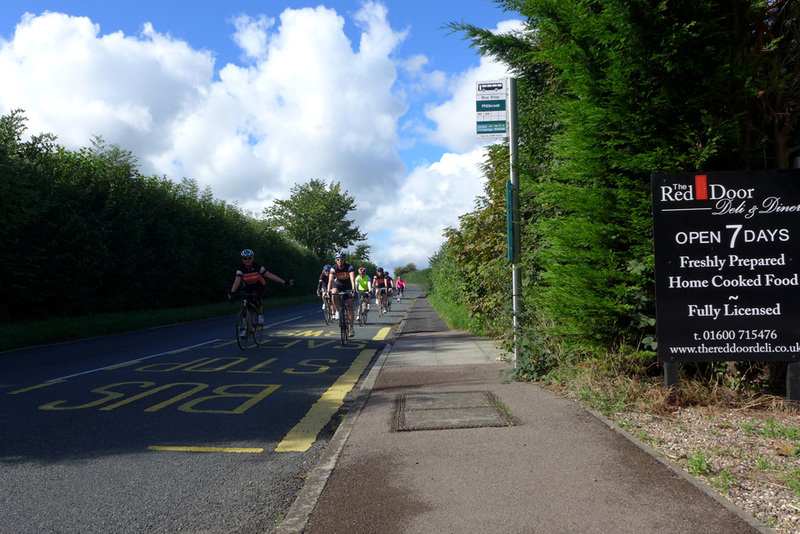 By 09.30, all 9 riders had turned up eager and ready to take on the challenge of Sue’s route. Just before the off, there was a chance for the obligatory group photo as well as a safety briefing and finalisation of the route details. 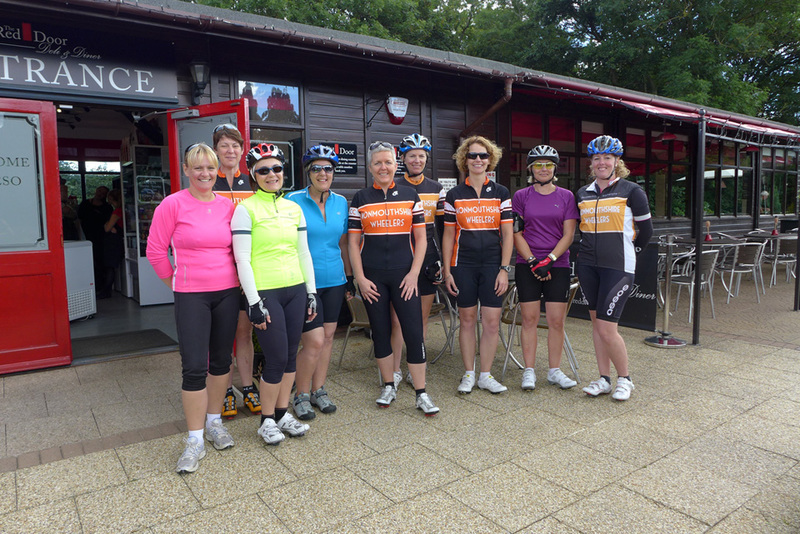 The group that set out was a mix of Mon Wheeler club members, experienced non-affiliated riders and cycling newbies! The route out from Usk took the group along the main road towards the A449 before branching off onto the B4235 and through lovely rolling countryside. Passing by the glider club at Gwernesney, there was an opportunity for the team photographer (and support car driver) to capture the disciplined riding technique on show! Carrying on, the group then started the descent into Raglan before a short climb out of the village and another chance for the team photographer to try his luck. Crossing the A40, the ladies then followed Groesenon Road through Mitchel Troy and the halfway point of the ride. Cunningly planned, the halfway stop was taken in The Red Door Deli, a great cafe stop for tired legs and thirsty ladies. The Red Door Deli is a favourite stop for Mon Wheeler club members and serves a great range of food and best of all, fresh coffee! The two tables of lady riders were quick to tuck into snacks and drinks alike with a vibrant buzz of conversation as an accompaniment. All to soon it was time to set off again back to Usk. A brief threat of rain disappeared as quickly as it appeared and the rest of the ride was done in beautiful dappled sunlight. As the group retraced their route, there were further opportunities for photos and a chance to show the wonderful backdrop of the Black Mountains in the distance. The ladies paused at the top of the last main climb to regroup before pushing on again on the last leg of the ride towards Usk. 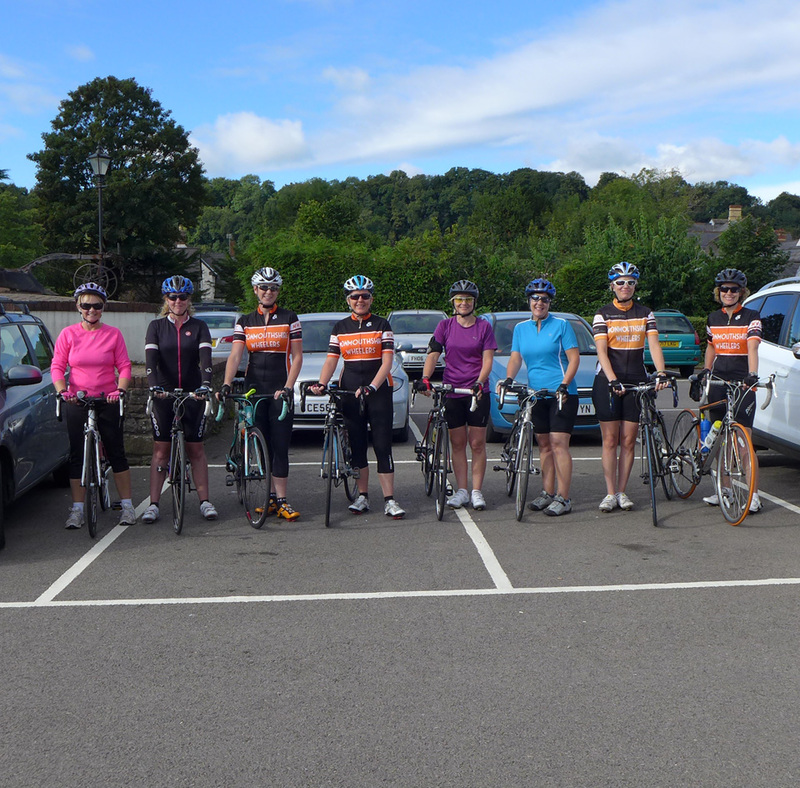 A last chance for photos in Usk Square as the ladies completed their ride was duly taken. All in all, it was a very successful ride with all participants having thoroughly enjoyed themselves. 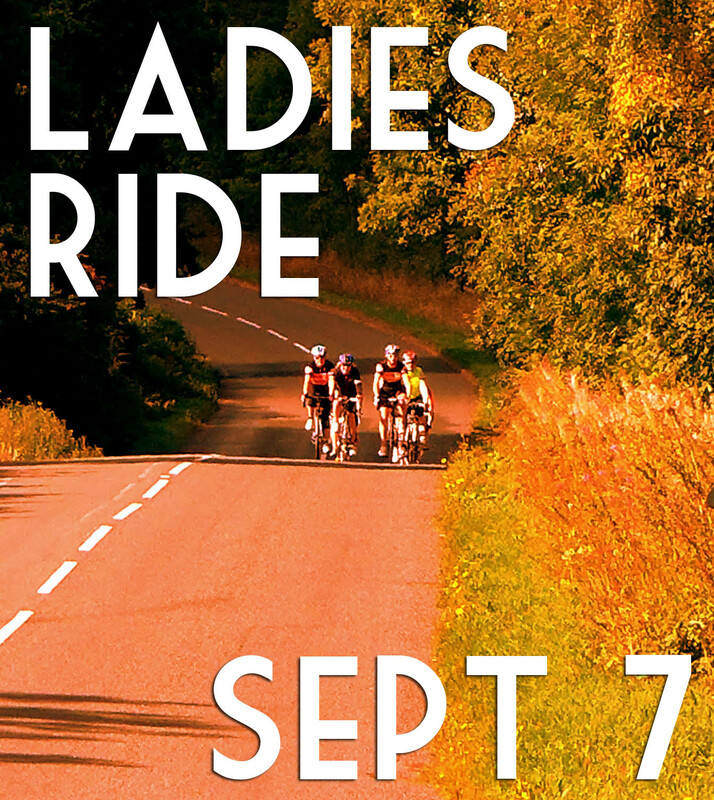 Keep a look out for further Ladies Rides in the future! ← 1st September Club Run aka Autumn is here!